Q: I want to set the style for Search Grid control, but I don’t know how set it? Could you tell me to set the style for Search Grid controls? Sets the auto resize mode of a grid. Sets the column sequence by the input column name order, the column sequence is an ordered collection of column names. The order of this collection represents the order of columns in a grid like display. The column orientation, either from left to right or from right to left depends on the end users locale setting. The column order string is delimited by comma. Sets the preferred height of the control in logical units. In other words, define Setting the value to -1 restores the default behavior.Scrolling will be set according to the number of records provided in the Display Tabular Data Model (TDM) versus the grid height. If the number if the total height of rows to be displayed is larger than the Grids height – then scroll bars will be displayed (you can limit the number of retrieved records from the database by setting the application’s workspace variable gridDefaultNumRequested to your preferred capacity (the default is 20). 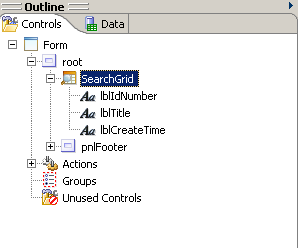 Each Search Grid (or any simple grid) column is directly related with a UI control (I.e. label, textbox or a dropdown). The column’s control properties set the column rendering attributes such as column width etc. When setting Grid’s column controls properties, note that within the column main properties, you will find a property named ‘control’. This ‘control’ can be expanded to reveal a group of sub-properties. Both types of properties set the way the column will be displayed. However, note the difference behavior impact between ‘main’ properties and ‘control’ properties which have similar name. For example, assuming we need to display a three columns Grid. We need to add three Label controls under the Grid control (drag 3 label controls and drop them under the Grid control). Indicates by how many columns this column is to be spanned. Value 1 or 0 means no span. Value of -1 means span the whole row. When set to false the whole column space is removed (our example grid will show only two columns). Sets the horizontal alignment of the (optional) icon and text. Sets the horizontal position of the text relative to the icon. Sets the column width. Setting the value to -1 restores the default behavior (defined by grid’s property). Sets the visibility of the column contents. Does not remove column space. When set to false the column space remains in Grid (our example grid will show three columns), but column content will be empty. For complete list of properties, follow the Smart Client designer properties tooltips, or read programmer’s documentation. Smart Client Framework also provides a Look and Feel control using Style sheet. This sets the UI controls appearance on the screen. The style sheet defines styles, each style group set of display attributes. In order to apply a style to specific Grid, the Grid’s style property needs to be set to the style name. The border for a search grid is applied around the table, including the column titles. It does not surround the search grid header (the area containing the Search Now button etc.). In order to set a border around the entire search grid, place the search grid in a panel and apply the desired border to that panel. Used to paint row’s background alternately between table’s background color and the specified alternate backgroundColor. For more information see the full discussion on Look and Feel. I am using weblogic 9.x. My problem is when I make any changed and compile my class i have restart the server to get the new class. 1.Is there any way where classes can be reloaded without restarting server? 2.Is there other way to register new xbean instead of put it in CrmServiceNames file ?